Here’s the low down on what’s good and what’s bad………. Now I’m sure most of us know that brown bread is better than white. If I am being nitpicking actually brown is not necessarily much better than white bread at all but wholemeal is, certainly in terms of fibre content. It’s not all about fibre though – when it comes to bread we need to be looking at the salt and sugar content too; it may not be what you thought! The bran – this is also very rich in fibre. The endosperm is the starchy carbohydrate store in the grain – this is what is ground down to make flour. When white bread is made, the bran and the germ are removed, so most of the nutrients are too. 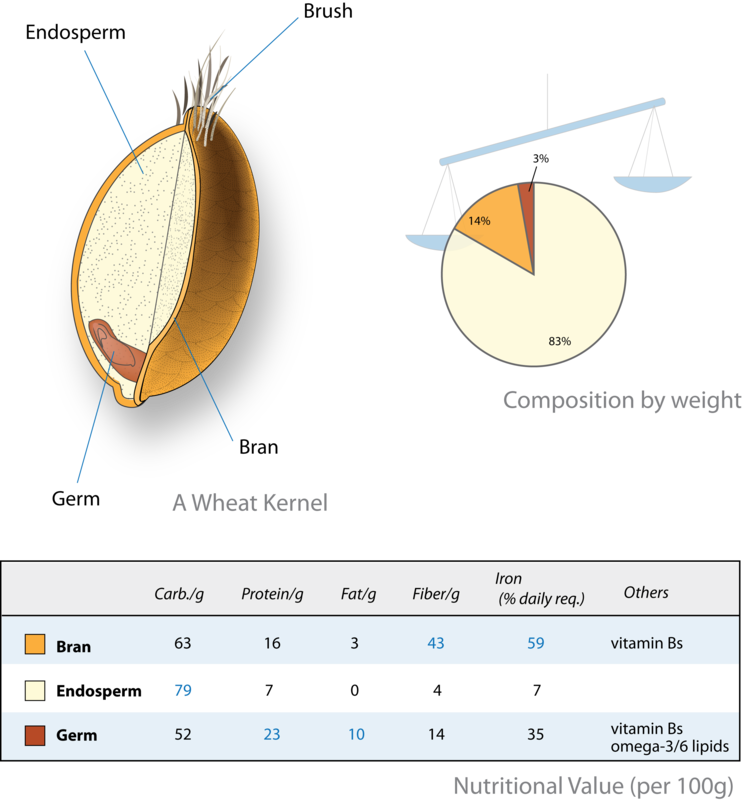 What we don’t always know (or can’t see easily) is actually how much wholegrain is actually in the product. Wholegrain products can be identified by the ingredients list; Wheat flour, wholegrain wheat flour or whole-wheat flour can all be listed. But even if these are first on the ingredient list (and so is present in the greatest amount) it is still not a clear indicator of the specific product’s wholegrain content. But wholemeal is not all it’s cracked up to be – it has been shown that wholemeal (and brown) bread has quite a lot more added sugar in it. So although the rich wholemeal bread above is a great source of fibre at 3.3g a slice, it contains 1.4g sugar – that’s half a teaspoon in 2 slices. Apparently they add it to counter the bitter taste of the wholemeal flour but I think it’s entirely unnecessary! Moving on to brown bread, this is not as good as it might first appear – it is not particularly high in fibre (1.1g a slice as below) as brown bread is usually a 50:50 split between white and wholemeal flour. Some brown breads contain caramelised sugar or molasses to help give it it’s brown colour as we associate brown with a healthier type of bread. I have a feeling this sugar is added just to ‘sweeten’ bread, so we buy more wholemeal and brown bread. It’s not necessary in the production of bread as they don’t put this much sugar in white bread. This is a sneaky manipulation of the product. Certainly something we wouldn’t expect, so as a consumer we are being misled and this makes me angry! Half and half – is this a good compromise? This was produced as a healthier option than just white bread (it’s also better than the brown bread). It’s particularly marketed to mums and dads with children that won’t don’t like the taste of brown or wholemeal. In some respects its a good compromise but it only has an extra 0.7g fibre per slice which I still don’t think is a lot. You would need to eat 25 slices of this bread to get your recommended intake of fibre (18g/day). I know you ‘would probably’ be eating other sources of fibre but most people are well under this target. The complete wholemeal breads that Warburton’s make contain between 2.6g- 3.3g which certainly is better. This is not small bread. I am thinking of the TV advert for the Yorkie chocolate bar – it’s not for girls. You’ve got to have a hearty appetite for this stuff. Having 2 slices will give you 274 Calories before you put anything anywhere near your bread. There will also be 1.16g salt, that’s about 1/5 of your daily allowance in these 2 slices too. Combine this with half a tin of tomato soup (at 1.3g salt) or some cooked sliced ham (1g) and a covering of butter and you are over half your daily salt allowance of 6g. That’s without any crsips on the side, without any breakfast or evening meal or any snacks! This bread is marketed as a lighter choice because basically its fresh air! Many ‘dieters’ opt for this bread due to its low Calorie content. It is also very low in fibre, so there really is nothing of value in this bread and I doubt it will satisfy your hunger or stave off the munchies not long after you have eaten it. 1. 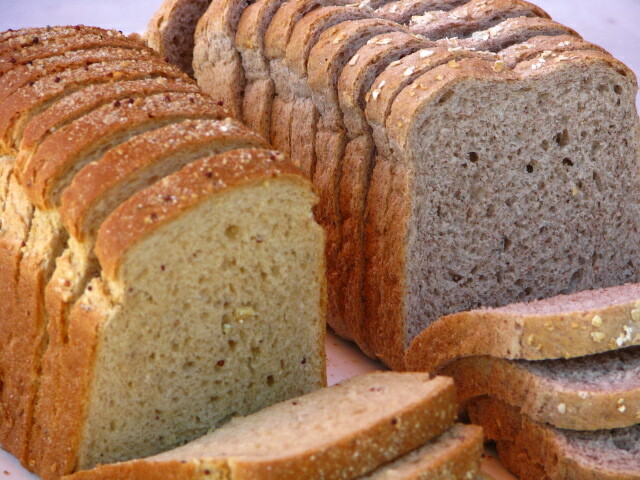 Try to limit your bread intake to 3 average / medium slices – your diet should consist of a variety of carbohydrates (bread, pasta, rice, potatoes) and always try to include some wholemeal / wholegrain sources. Watch your slice thickness if cutting it freehand yourself. 2. Go for a proper, good quality wholemeal bread. This is the best option of all the breads in terms of valuable nutrition (Warburton’s make (26 different loaves in total, never mind the rolls or bakery ‘snacks’ they make!). This doesn’t mean you can’t have any white bread – just don’t make it the bulk of your purchases. 3. Lighter, ‘diet’ bread is not necessary! I’ve just realised Warburton’s make all the Weight Watcher Bread. Don’t be fooled by this bread – just eat good quality ‘non diet foods’ you will be much better off both in terms of health and money in your pocket). Read my earlier post on The truth about low fat foods. This post follows May we eat bread from last week (1st May 2014) so catch it here if you missed it.